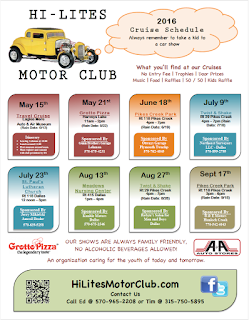 Well the wait is over... the new 2016 Hi-Lites Motor Club Cruise Flyer is now available. Mark these dates in your calendar, because the fun is about to begin shortly. During the monthly meeting on March 2nd we ratified the 2016 schedule dates, times and locations. We also sang Happy Birthday to a couple of wonderful members. If you haven't been to one of our meetings yet, you'll want to get to the next one. Things are happening with our club and it just keeps getting better and better. This season we are trying something new with our first cruise. It is really going to be a cruise. We are traveling as a group, to the Eagles Mere Auto Museum. We have done some travel cruises in the past but this one is looking like it may be a record breaker as far as attendance is concerned. We look forward to you joining us. Check our events page for more details. Last season we worked with some community members and offered Trophies at our cruises in honor and memory of a loved one. If you are interested in having your loved ones name used on a trophy given out at one of our events, please contact us and we will see what we can do to make it work. We are also looking for some more donations of door prizes and children's raffle gifts. Monetary donations can also be made towards a particular aspect. 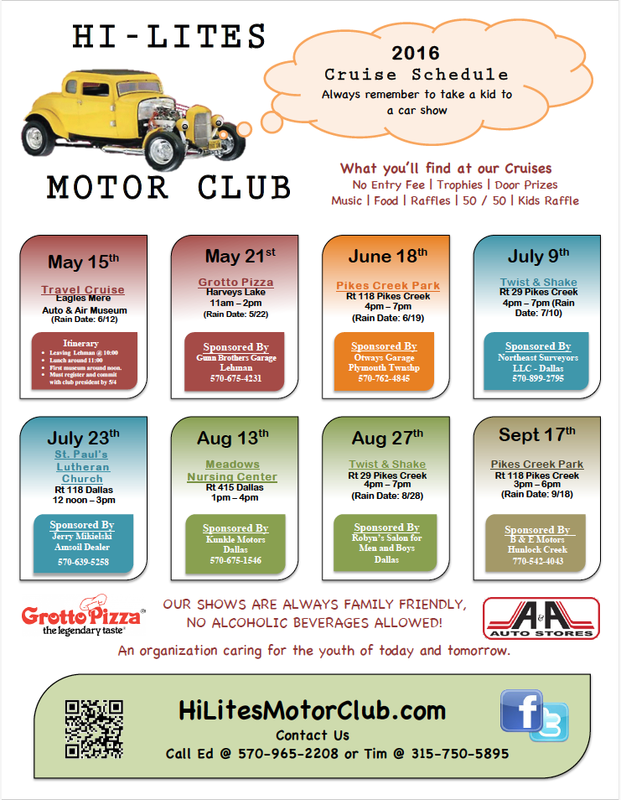 Our next meeting is scheduled for April 6th at Grotto Pizza Havey's Lake starting at 7:00pm. All are welcome.